Union Commanders Large Albumen Photograph. Albumen measures a substantial 9.25" x 11.25", with the mount an overall 11.25" x 18". Titled "The Defenders of Our Union, 100 Commanders of the Union Army." Published by C. F. May of New York in 1862. 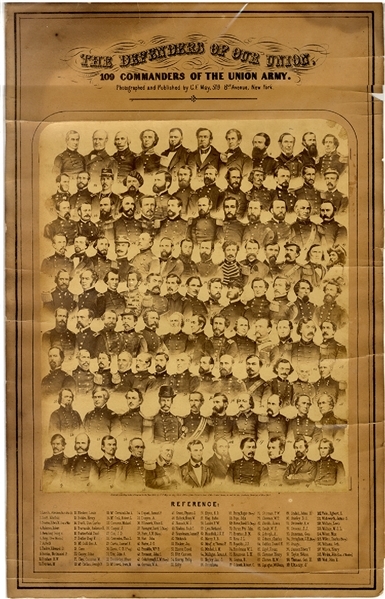 109 men are pictured and identified in the key below, including President Lincoln, Secretary of War Stanton, Kit Carson, John Fremont, Winfield Scott Hancock, George McClellan, John Reynolds (Killed at Gettysburg), and so many more Union Generals. A fantastic albumen, having some toning along the top and left edge, and a few creases to the mount, the albumen is excellent. A dramatic display piece.